At Liverpool Music Week 2017, Patrick Clarke looks at the past, present and potentially grim future of a city whose music scene is caught in the flux of gentrification. Just as Liverpool has always liked to consider itself somewhat separate from the rest of the UK so too is its musical culture often a unique proposition. I remember one cabbie, when I first moved there alone more than five years ago, performing an enticing monologue about the ‘invisible wall’ that surrounded the region, separating the Scousers apart. “Once yer in, yer in!” he declared with relish as he concluded what was quite clearly a pre-planned speech. This cuts two ways. Liverpool is a fertile breeding ground for local bands, but that sense of insularity sometimes causes it to suffer. A Merseyside date is often absent from tours by larger artists in favour of Manchester, which is seen as an easier place to sell tickets. There’ve been breakout acts over the last decade, the likes of All We Are, Hooton Tennis Club and XamVolo signing to nationally reputed labels (Domino, Heavenly and Decca respectively), but for the majority of young artists making your presence felt beyond Warrington is an imposing proposition. Yet within the bounds of that invisible wall it’s one hell of a place to be into music. The quite remarkably disastrous ‘Hope And Glory’ aside, Liverpool’s festival circuit is an eco-system all in itself. New indie additions such as WRONG Festival can be greeted with a rapturous crowd, as can the internationally acclaimed Psych Fest, specialist events focusing on Irish music, African music, reggae, disco, dance and so on, plus the mass-appeal likes of Liverpool International Music Festival, a free event in the city’s largest green space, Sefton Park. There’s also Sound City – which used to be the daddy of them all but has since tapered off to limp desolation, but more on that later. However, recent years have seen something of a seismic shift in the way the powers-that-be in Liverpool treat their music scene. The local government is more than happy to dine out on The Beatles at any given opportunity. Magical Mystery Tour buses ferry tourists from a reproduction of the now-closed Cavern club to a statue of Eleanor Rigby, and onwards still to Penny Lane and its oversaturation of barbershops, but the way the current Merseyside scene is buffeted and shafted by the familiar spectre of unregulated gentrification feels somewhat at odds. Liverpool Music Week makes an excellent barometer of where the city’s music stands. 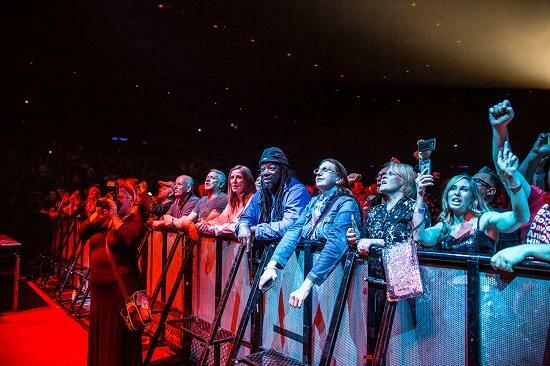 Not so much a festival as a load of powerhouse gigs hosted thick, fast and sometimes three-at-a-time at venues across the city, it has three distinct focuses. 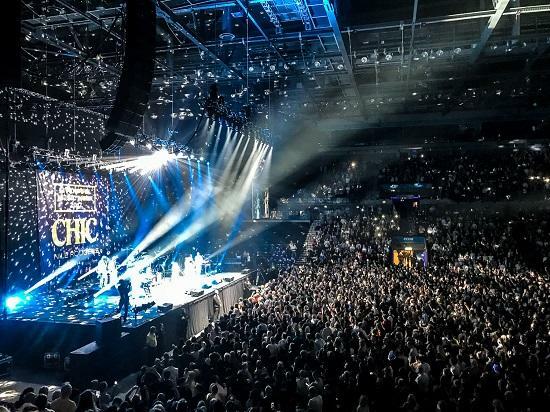 First, it brings a massive name or two that might not otherwise hit the Mersey shores - Chic and Nile Rodgers’ sellout show at the Echo Arena was the key draw in this department for 2017. Second, there’s the latest bunch of excellent artists from around the world (Blanck Mass, Princess Nokia, Goat Girl etc). Third, there’s the finest picks from the local artistic community, Queen Zee, Godonmyright, Rongorongo and more. 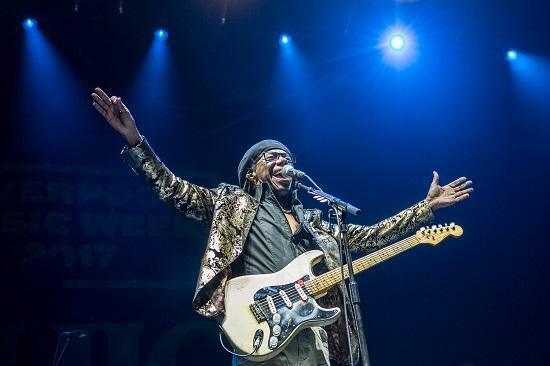 The vast majority of the gigs that tQ catches this Music Week are superb (full disclosure: we’re only able to stick around for the first six days of what’s more like a fortnight of successive shows). 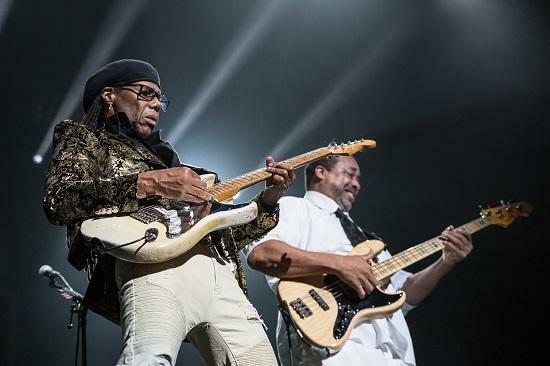 Chic and Nile Rodgers, for example, was never going to be anything other than great. A by-the-book barrage of the particularly abundant crop of hits Rodgers has had a hand in over the years. Billed as the ‘Opening Party’ for the entire shebang, such is the band’s ability for the universal pop classic that the atmosphere inside the arena captures the people of Liverpool’s love for music in its purest essence – a colossal, diverse crowd united in the sublime joy of carousing their way through a belter of a gig. But in the days that follow, things feel altogether more disjointed when it comes to the wider, intangible sense of atmosphere, and not just because the music gets more specialised from there on out. When I compare the event to the first Music Week I covered, for local site Getintothis and magazine Bido Lito!, just three years ago - there’s something missing. The gaping hole in the middle of Liverpudlian music is the construction site where once The Kazimier stood. Known as The Kaz, it was the best venue in Liverpool by a country mile and in this writer’s (biased) opinion the best in the country, an odd, hexagonal shape with a rickety balcony open to all, the stage just high enough to be seen in all corners, low enough to let things get messy should the concert require. Liverpool Music Week 2014 saw astounding sets there, from the rabid, off-kilter mania of Liars to the swarming emotion of The Antlers, while throughout the years it’s hosted all manner of gigs that would resonate to the very soul. New Year’s Eve 2015 was the last night at The Kazimier, a fitting sci-fi-themed rave of a send-off that concluded with a giant emu puppet fighting an enormous robot in the street before a crane-hoisted UFO disappeared into the night sky. Not long before that, property developers had been given the go-ahead to bulldoze this cultural behemoth in favour of a tower block. Not long afterwards, its baby sibling of a venue, the much smaller MelloMello less than a minute's walk away, was bought out and turned into a pizza restaurant. The loss of these two local favourite venues and creative hubs had a particular geographic effect. They formed the centre of Liverpool’s music scene, and they were in the heart of the city itself, a stone’s throw from the shops, nightclubs and cheap bars. When The Kaz was bulldozed and Mello became yet another pizza joint, this anchoring point was removed and split in two. While lesser venues still exist around the city itself, there are now two main musical hubs: the Baltic Triangle to the south, a loose-knit collection of independent venues in former industrial buildings, and the docklands to the far north, where the people behind The Kazimier run a new venue, The Invisible Wind Factory. Three years later, the bulk of Liverpool Music Week is split between these two regions. The Baltic Triangle hosts a number of the most interesting shows. The Abstract Orchestra reimagining Madvillain’s Madvillainy at 24 Kitchen Street, for example, is an excellent indicator of what Music Week’s fringes should be about, with the hip-hop classic’s entrancingly sinister pomp and circumstance twisted into a hypnotic instrumental experience. The Invisible Wind Factory, meanwhile, a huge re-purposed warehouse space, hosts the largest non-Chic shows of the event. Mount Kimbie provide an intoxicating show in partnership with local dance night stalwarts Abandon Silence. That is, once they turn up, having already played a show in London that same evening. Later in the week, and sadly after tQ has departed, the mighty Princess Nokia plays there - a magnificent performance by all accounts. There are still gigs in the city centre, most notably a series of DIY shows at EBGBS, a nightclub basement not far from the shell of The Kazimier. One night we catch Kero Kero Bonito in its claustrophobic confines. Musically, their bubblegum pop about flamingos and eating too many sweets is far too saccharine for this writer’s taste and we’re unable to stick out more than three songs before departing on the long walk to Constellations in the Baltic Triangle to see something heavier and altogether more excellent in the form of Elevant, Iron Witch and the blistering Bad Meds. Sadly, there’s not much of a crowd at Constellations, despite the fact that Bad Meds are one of the best live bands the northwest has to offer right now. By all accounts, the rest of the DIY shows in EBGBs (Goat Girl, Girl Ray, Japanese Breakfast and more) are as packed and successful as Kero Kero Bonito, while the shows on the outskirts are not. Take Blanck Mass back at 24 Kitchen Street, for example. His set is a colossus and the best of the week, a fitful, anxious blast of shudderingly loud electronic squalls backed by restless flashing visuals. Kitchen Street is a better venue than EBGBs, and a name like Blanck Mass should easily be ‘big’ enough to fill it, but what should really be the centre of the music scene has been shafted out to the borderlands. When you step outside a gig at 24 Kitchen Street, you’re not welcomed with the view of a vibrant city centre, but with gloomy, empty roads and rows of identikit warehouses. The Baltic Triangle in and of itself can be a great district. When festivals like Psych Fest take over a number of venues at once they create the same kind of buzz that the city centre once had, and many of the spaces are individually superb. However as a collective enterprise, an attempt to replace a music scene that was once interwoven into the fabric of the city itself with what the Baltic Triangle’s own website tries to bill as an equivalent to New York’s meat-packing district, a separate ‘cultural quarter’, it rings hollow. The spectre of ruthless gentrification hangs heavy over the Baltic Triangle. Their website describes the area thusly: “Land and buildings available for sale, a Hampton by Hilton hotel and new businesses in a hurry to take advantage of the area’s benefits. It’s no wonder property developers with an eye for potential and emerging trends are investing here.” It would of course be heartening to see Liverpool have a creative quarter of the sort that the Baltic Triangle is trying to sell. “Imagine an area where musicians rub shoulders with photographers, artists, fashion designers, digital agencies, architects, film-makers, young entrepeneurs, recording studios and there’s a bunch of drinking holes and eateries, nightlife venues, internationally acclaimed arts festivals and galleries to drop-by on,” as the website puts it, but the reality of this is that the actual creatives in the community are treated with little but contempt, while property developers encroach further still on what was supposed to be a safe haven, a reparation of sorts for the destruction of the Kazimier. 24 Kitchen Street, for example, is not being treated with the kind of love and reverence for creativity that the Baltic Triangle is supposed to be promoting. In December last year, the venue lost a bitter long-running battle against a property developer granted permission to build £40million-worth of 200 flats across the road, noise complaints from which may well force the club to close. “Despite valiant efforts and widespread support, Liverpool Council chose to overlook our objections and accept the residential development application next door ‘as is’” said the venue. The Baltic Triangle is in its early stages, granted, but when the early stages look like this, it’s hard to take them seriously when they promise anything that can be billed a ‘creative quarter’ of the kind their description would invite us to imagine. It’s the same story too in the northern chunk of Liverpool’s exiled creative community. Around the Invisible Wind Factory, so far from the city itself that a cab ride is necessary just to catch a gig, there are a number of small-scale indie venues that provide a welcome refuge to the weirder sides of the Merseyside music scene. But this area is also under threat by a development known as ‘Ten Streets Liverpool’. Drop The Dumbulls, a venue and gallery at the heart of this area is faced with potential demolition as the developers move in. Formerly a part of the old Kazimier/MelloMello-led creative community in the city centre, their new home in the outskirts is now faced with another extinction as the developers submit proposals that will include its demolition. In a lengthy statement on Facebook the venue said: “What seemed like property developers speculating on old warehouses and buildings summer last year didn’t particularly bother us, too much. “Gentrification would be painful but slow.” we thought.... [but] this has shocked many in the community including our volunteers, performers, promoters, those who come to Dumbulls events, and the building’s owners. 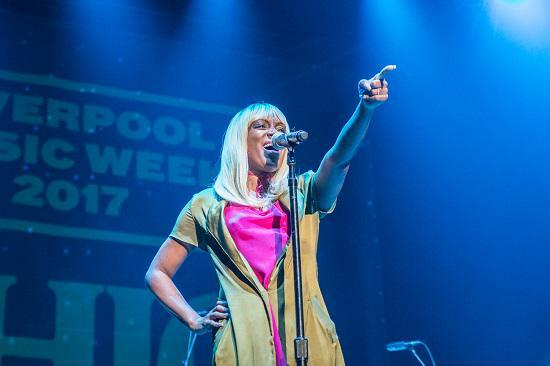 To return to Liverpool Music Week as a barometer of the city’s treatment of its music, this year’s edition paints a picture of a city in an ongoing war for its musical identity. In 2014 the event felt so centred and assured, while this year it feels more sporadic and separated. The creative communities to the north and south offer fantastic shows, while in the city EBGBs shows there’s still enough of a buzz for live grassroots music in the centre. The artists in the areas now marked as The Baltic Triangle and The Ten Streets are valiantly attempting to re-establish a combination of the two but what’s already apparent, as property developers encroach on these creative spaces, is that they’re still fighting a war against Liverpool Council for their right to exist. Given the council’s keenness to sell the city to tourists on its musical heritage, this war makes no sense at all. As mentioned earlier, Liverpool Sound City was once upon a time the jewel in the city’s live music crown. An SXSW-style event spreading its wings across the entirety of a musically rich city centre with The Kazimier as its central hub, any Scouser there to experience its early days will be keen to wax lyrical about the ‘legendary’ shows it provided, more often that not in The Kazimier or MelloMello. In 2015, the decision was made to traditionalise the festival by moving it out to an enclosed arena with fixed stages out near the Invisible Wind Factory. After a mixed reaction to the first two editions, 2017 was a complete disaster, with low attendances, a deeply sub-par lineup and a desolate, soulless dust-bowl of an arena making for an altogether embarrassing experience. It has been announced that in response, 2018 will see Sound City “return to its roots” in an attempt to recapture the frantic city centre joy of its former incarnations. But with Liverpool’s musical landscape being buffeted as much as it is, it’ll be interesting to see just how much of a city centre they’re left to work with.